THE LONG-AWAITED AUDIO BOOK ON CD OR IN MP3 FORMAT!!! This audio book on 2 CDs is designed for those who already have a basic knowledge of hypnosis. 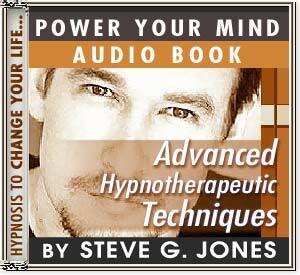 In his first book, "An Introduction to Hypnosis", Dr. Steve G. Jones M.Ed. teaches the basics: Inductions, deepenings, scripts, amnesia, and trance termination. Now, building on that knowledge base, he takes you to the next level. This book is entirely focused on clinical hypnotherapy in a professional setting. If you are already a hypnotherapist, get ready to skyrocket your practice with these advanced techniques. If you are a beginner, prepare to move quickly and powerfully to the next level! I’m sure all of you know that I enjoy hypnotherapy. I feel that hypnosis is rewarding on a personal and a professional level. I am able to make a living practicing hypnosis, but I also get a lot of fulfillment from it. I think that everyone should be educated on hypnosis whether you want to practice it or become hypnotized or to just learn more about it. And I get so much satisfaction from teaching others all that I know about hypnotherapy. I get calls and emails from lots of different people around the world with questions about hypnosis. I have an audio book called "Advanced Hypnotherapeutic Techniques". This audio book is for people who want to go beyond the basics of hypnotherapy. Perhaps you are looking for a new career and you think that you have finally chosen your path. Or perhaps you would like to learn hypnosis so that you can use it on yourself (self-hypnosis). No matter what you reason is for learning about hypnosis, this audio book is a great way to learn more about hypnosis!